Fourth Presbyterian Church joins with other houses of worship in declaring its worship space—and entire campus—a gun-free zone. Police officers are exempt from the rule that carrying firearms into the church is prohibited. 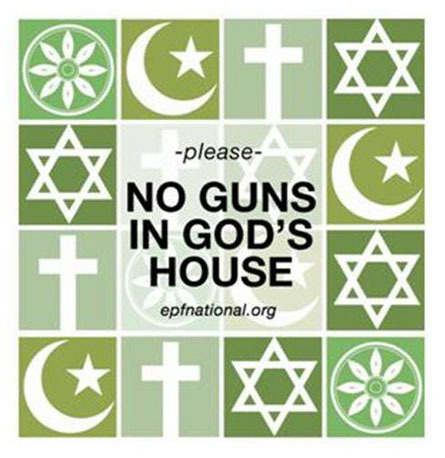 No one else may bring a firearm onto the Fourth Church premises. 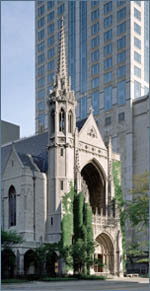 Fourth Presbyterian Church provides persons sanctuary on its grounds as a gun-free zone. People on our property are offered a safe place to worship God, find tranquility for prayer, and interact peacefully with others for fellowship, learning, working, and meeting. Fourth Church also works for a peaceable city and country. God calls all of us to live out the gospel as agents of reconciliation, participating in God’s project to build God’s reign on earth by urging all people to put down their weapons, strengthen community, and honor the value of the lives of all who are part of the human community, as each is loved by our Creator. In 2011, the Advisory Committee on Social Witness Policy of the Presbyterian Church (USA) reported that “there are about 270 million privately owned firearms in the United States. If they were evenly distributed, almost every woman, man, and child in the entire population would possess a gun. We are, as a country, armed and dangerous—to ourselves” (“Gun Violence, Gospel Values: Mobilizing in Response to God’s Call,” p. 4). As Christians we follow the Prince of Peace, Jesus Christ. He reprimanded Peter for grabbing a weapon in his defense, saying, “For all who live by the sword die by the sword” (Matthew 26:52b). The solution to gun violence in our country is not more guns; the epidemic of gun violence breeds distrust, fear, and disconnection among people. Workplaces that permit employees to carry guns are five to seven times more likely to be the site of workplace homicide. Gun owners are six times more likely to be a victim of gun violence than to use their weapon in self-defense. (See “Gun Violence, Gospel Values,” p. 7). 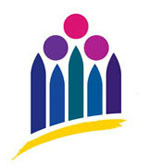 The 1990 Resolution on Gun Violence adopted by the 202nd General Assembly (1990) of the Presbyterian Church (USA) refers to the “peaceable kingdom—a society where God’s justice reigns, where reconciliation replaces anger, where an open hand and a turned cheek replace retaliation, where love of enemies is as important as love of neighbor.” Isaiah 65 gives a vision of “new heavens and a new earth . . . [where] the wolf and the lamb shall feed together. . . . They shall not hurt or destroy on all my holy mountain” (Isaiah 65:25). The church is called to embody God’s vision of shalom for the whole human community.